Almost a month ago the Smoloskyp (Torch) publishing house (Kyiv-Philadelphia) turned out the first volume, long-awaited in not only scholarly circles, of the complete works by Vyacheslav Lypynsky, a major Ukrainian twentieth-century public and political thinker, founder of modern Ukrainian conservatism and the statehood school in historiography. This first volume of Lypynsky’s epistolary heritage comprises a total 550 letters to correspondents in alphabetical order from A to Ukrainian Ж (Zh). This almost 1000-page impressive tome, a bible, if you like, for Lypynsky researchers, contains the texts of letters to Oleksandr Barvynsky, Wilhelm von Habsburg (Vasyl Vyshyvany), Borys Hrynchenko, Mykhailo Hrushevsky, Vasyl Domanytsky, Dmytro Dontsov, Dmytro Doroshenko, Serhiy Yefremov, and Andriy Zhuk (a total 64 individuals, editorial boards, and non-governmental organizations). It also offers four prefaces which attempt to analyze the letters’ printed sources, a foreword by editor-in-chief Yaroslav Pelensky, an archeographic introduction, and a 200-page commentary. Two-thirds of the whole material was copied by Roman Zalutsky who, unfortunately, died before the book appeared. He made available all the letters kept outside Ukraine. 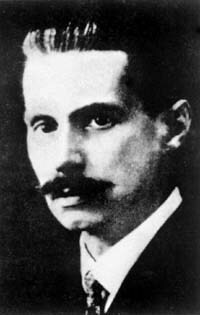 Chronologically, the letters practically embrace Lypynsky’s whole life, the first dating from 1908 and the last to 1931, when they were dictated by him shortly before his death. Before discussing this volume and the impact it could have on the reader, let us return to the history of the idea to publish a complete set of Lypynsky’s works. In the early 1960s, well-known Philadelphia-based Ukrainian writer and journalist Yevhen Zyblykevych and a group of conservative public figures made a joint effort to set up the Vyacheslav Lypynsky Institute of Eastern European Studies for the purpose of collecting the original and copied manuscripts of prominent figures, to be later published in a complete set of works. The publication concept was framed by the late Ivan L. Rudnytzky, one of our greatest conceptualist historians. He intended to place the whole heritage in 25 volumes, with a few of them containing Lypynsky’s archive, including letters written by and to him. The first two volumes published as part of this scheme comprised letters from Osyp Nazaruk (prepared by I. Korovytsky, 1976) and from Dmytro Doroshenko (prepared by Rudnytzky, 1973) to Lypynsky. Also printed were such historical works as Participation of the Nobility in the Great Ukrainian Uprising under the Leadership of Bohdan Khmelnytsky (editor and foreword by L. Bilas, 1980), Ukraine at the Turning Point, 1657-1659 (editors L. Bilas and Pelensky, 1991), and Letters to Brother Agriculturists (1995). Still awaiting publication are some of Lypynsky’s historical research and politico-social writings as well as the next volumes of correspondence, in which his letters alone will require another three volumes or so. Unfortunately, if the complete works are being further prepared at the current pace, only our children, if not grandchildren, will be able to see the last volume. It took thirty years for six volumes — just a fourth of the whole planned number — to come out. Now about the contents of the first volume of Lypynsky’s Correspondence, which took seventeen years to be published. The letters, already partially quoted in scholarly publications over the past ten years, provide first-hand unique information on Lypynsky’s activities of as a public figure on the eve of World War I, on his attempts to find a place in the pleiades of pre-Revolutionary advocates of democracy, on his addressing the problems of the national conservative movement. The letters also provide a host of new materials about Vyacheslav Lypynsky’s life story. For example, V. Domanytsky’s books on the cooperative movement, How Peasants Fare in Foreign Lands and Sericulture, are common knowledge, but absolutely no one knew anything about Lypynsky’s role in the making of this book. He not only proofread, edited, and arranged the publication but also raised the funds. 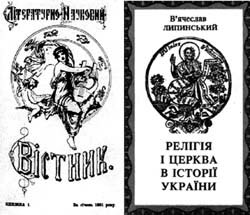 The letters trace the history of the first and second edition of the History of Ukraine by Mykola Arkas and shed light on the debate on a review written jointly with Mykhailo Hrushevsky. Of special importance are articles for the collection Zdziejow Ukrainy (From Ukraine’s Past, 1912), the first publication that brought the author nationwide fame. Lypynsky in fact intended to continue this series with another two volumes. In a letter to Serhiy Yefremov, he even discussed in general terms the next volume’s contents. Lypynsky also helped Hrushevsky illustrate his famous Illustrated History of Ukraine (1911). His letters to Andriy Zhuk, the bulk of this volume’s content, contain Lypynsky’s valuable ideas on the establishment and activities of the Vilna Ukrayina (Free Ukraine) nonparty group in 1911. This group, a precursor of the Union for the Liberation of Ukraine, was supposed to disseminate the ideas of independence both in Ukraine and all over the world. In general, correspondence with Zhuk is very interesting as far as Lypynsky’s political ideas are concerned. Some of his epistolary passages are true aphorisms, for example, “We are not yet a nation and will never be one unless we have a state. Whoever opposes independence kills the idea of a nation” (letter of April 9, 1920). This phrase still holds good today 83 years later. Can we possibly claim to have a nation of fifty million if most of the population has not been brought to respect their own state and its culture? Meanwhile, all facile talk about a political nation disguises the true wish of the Eastern Ukrainian elite to apply the “Little Russian” image to all Ukraine. Vyacheslav Lypynsky wrote in his letters that there should be a normal stratified society with rightists and leftists who must cooperate, if necessary, for the benefit of Ukraine. Yes, there still was at that time a deeply-rooted stratum of rich people, Ukrainian in a spiritual rather than ethnic sense, who cared about the nation with actions, not mere words. Since precisely these people were swept away by the whirlwind of revolution, Ukraine saw a different kind of a ruler who was not tied to this land with any moral and ethic principles, the user, not master, of a specific land, one who was not interested in Ukraine as such. He disliked democracy or, rather, the pseudodemocracy which we do not like either. We were warned about this in the not so remote past by Vyacheslav Lypynsky who was born at the Volyn village of Zahurtsi into a family of Polish gentry descent. It is impossible to mention in a short article all the issues touched upon in the letters. Suffice it to recall Lypynsky’s mission as ambassador of the Ukrainian state to Austria-Hungary (1918), the establishment of a worldwide Ukrainian hetmanist network (the 1920s), and the way Lypynsky interpreted the idea of the National Right. The reader will also find it very interesting to learn about the roots of the conflict between Vyacheslav Lypynsky and Hetman Pavlo Skoropadsky. Trying to keep the idea unblemished, Lypynsky had to break with the hetman, and the irreversible tragedy of this situation runs through his letters to D. Doroshenko, O. Zherebko and T. Hornykevych, also sent to major Ukrainian newspapers. The publication of this book is undoubtedly a significant event not only for scholars. We think this work will be as important in cultural life as once was Orest Subtelny’s History of Ukraine or the essays on Ukrainian history by Natalia Yakovenko and Yaroslav Hrytsak.